Spice up your music by adding background tones and overlays! 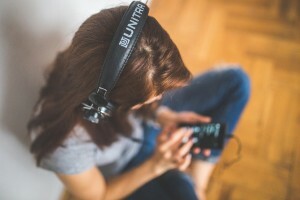 In this article, the team of Ambient-Mixer.com wants to present a different way of using ambient noise and background sounds to improve your experience of listening to music. Maybe you will like our examples or you find even better combinations while browsing our categories. If you are on a computer, using YouTube, Spotify, or your saved files to listen to music, just open the ambient mix that fits you in a browser window and tab. If you are using the mobile app, we recommend playing the music from your player first and then opening the app. But what can you so? The possibilities are almost endless. To get an idea, we have looked around the page and checked user suggestions. Following, you will find some combinations that work just perfect for relaxing, studying, reading, or generally enhancing your favorite song’s flair! It’s an effect sometimes used in music itself, but only very rarely throughout a song. Vinyl scratches and low tones can give you the impression of not listening to a track bought on iTunes but an old record you found in the attic. What could be cooler than studying in Hogwarts? Add the sounds of the vast Hogwarts library to your playlist ans get out the books. Hermione will be proud of you! Try it with this one: Hogwarts Library! If you are not one of a few fortunate one, you do not have the luxury of an open fireplace in your home. That doesn’t mean you don’t have to miss out on the feeling! Mixed with some other background sounds and a howling wind, a fireplace ambient can transport you right into a cozy, snowed in cottage in the country. Wind, rain against your window, a good book or perfectly prepared study guide — what else do you need? The weather isn’t always in our favor, but if you like the sound of rain on the roof while you are studying or cooking, then rain and (thunder) storm background noises will give your music an extra boost. While dogs may be ‘men’s best friend’, cats have an undoubtedly relaxing effect. No matter if you pair up a cat’s purring with rain, a crackling fire, or any other combination of ambient noise you like, you instantly feel less alone. Those are just some of our favorites. But your imagination shouldn’t end here. Add a creepy or futuristic touch to your favorite songs, or spice up your music with some nature sounds. Tell us your favorite combination!